The body has the ability to heal itself. Following illness, stress, injury or disease, it is in a state of “imbalance”, and vital energy pathways are blocked, preventing the body from functioning effectively. 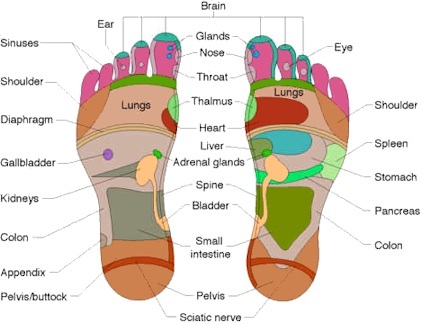 Reflexology can be used to restore and maintain the body’s natural equilibrium and encourage healing. Reflexology, an ancient art practiced by all cultures, is a science based on the premise that there are zones and reflex areas in the feet and hands which correspond to all glands, organs, parts and systems of the body. The physical act of applying pressure using thumb, finger and hand techniques to these reflex areas results in the reduction of stress which promotes physiological changes in the body. A new way to look at your feet! Each foot has over 7,000 nerve endings, 26 bones, 107 ligaments and 19 muscles. This type of drugless therapy creates a physiological change in the body by naturally improving your circulation, which reduces your body tension and enhances relaxation. It aids in the elimination of body waste and restoring the body functions to better health.